A historical look at our knowledge of electricity and the ways we use it. Bodanis (E=mc2, 2000, etc.) begins with the 19th-century researchers who, with only rudimentary understanding of electricity, found ways to make it perform miracles. Joseph Henry, teaching in an Albany boys’ school, began experimenting in the 1820s with the newly discovered electromagnet. He quickly realized that an electrical pulse could carry a signal down a wire—the key principle of the telegraph. Samuel Morse turned the idea (which others had played with over the years) into a practical device by 1844. Three decades later, Alexander Graham Bell’s telephone extended the principle to the spoken word. Theory, catching up with practice, deduced that particles of electricity—electrons—carried the signals along wires at nearly the speed of light. Other experimenters—Faraday, Kelvin, Clerk Maxwell, Hertz—learned that electrical pulses generate a field that spreads not just along wires but through space. The first practical result was radio, which Bodanis plausibly argues changed history more than any previous electrical device. Another technical breakthrough was waiting around the corner in the form of the semiconductor, which made possible the manufacture of small, inexpensive electrical devices, ultimately including the modern computer. 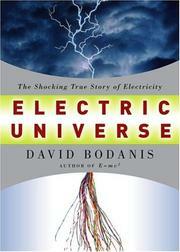 Bodanis continues his survey with the biological role of electricity as chemical ions carry signals through the nervous system and the rest of the body. By regulating the amount of certain ions, researchers can design new medicines to treat diseases formerly beyond the reach of science. Bodanis sometimes overreaches in attempting to show the impact of inventions on society—rock ’n’ roll gained its foothold in youth culture well before the widespread use of transistors either in radios or in musical instruments. But his accounts of the lives of inventors and theorists are riveting nevertheless, including his quotations from Hertz’s journals. An illuminating and rewarding exposition on the links between scientific discovery and daily life.